Nestled in a quintessential residential area just a few minutes away from the heart of St Julian’s, this spacious holiday home in Swieqi is all about family fun vacations in one of the most sought after locations in Malta. Being situated in a residential area gives this house a peaceful environment while still being a short walking distance away from St Julian’s and all its liveliness. The property is situated in one of the best areas for self-catering holidays in Malta, just a couple of minutes walking distance to the sandy beach of St George’s bay, the Baystreet shopping complex, the Intercontinental hotel, the Hilton Malta, the entertainment district of Paceville as well as the beautiful, quaint bay of Spinola. You truly get the best of both worlds – close enough to explore the main entertainment district on foot, while still being located further enough from all the noise and clamour. A car is not required as the house is literally located a few minutes from any amenity, however, for those opting to rent a car, parking is readily available for free just in front of the house itself. The house is set on 3 floors. Its entrance leads to an airy hallway, which in turn leads to the living and dining area – a spacious room adorned with comfortable sofas and a large dining table fit for 10 guests. The hallway extends further to the homely kitchen which is fully equipped with all appliances and utensils. The classic wooden kitchen is bright and spacious, ideal for preparing home cooked meals with your loved ones. Moreover, on this floor one can also find a convenient half bathroom. The repose area is located on the first floor where one can find 4 bedrooms. Two of the bedrooms comprise of double beds, one of which includes an en-suite bathroom equipped with shower cubicle. There is also another bedroom with 2 twin beds, and a further individual bedroom with one single bed. All of the bedrooms come with parquet flooring and are bathed in natural light. The neutral tones if the bedroom exude an aura of calmness and further enhance their natural light and airiness. On the same floor there is also a very spacious family bathroom with bath tub. The outdoor area is located on the second floor, consisting of a hot tub and gas BBQ with an ample seating area for 6 people. 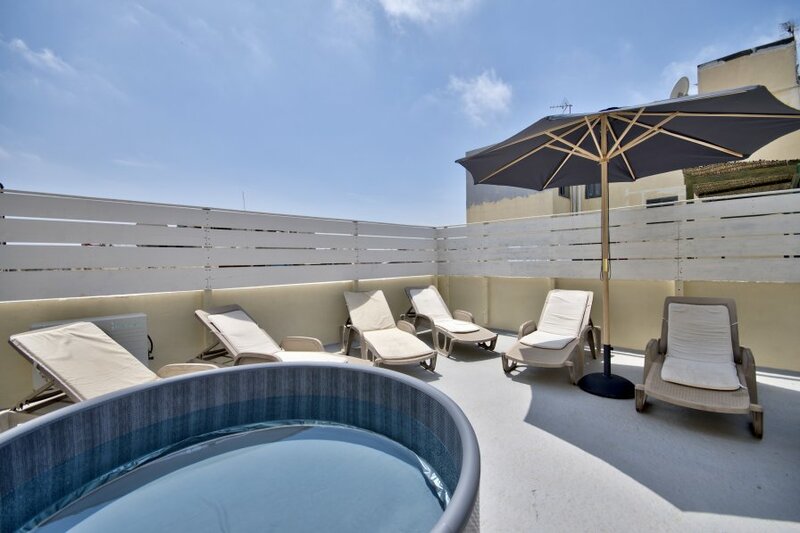 This area is perfect for sunbathing and topping up your tan during the day or for enjoying typical Maltese al fresco dinners under the clear night skies that are so synonymous with Maltese summers. The games room is located on the lower level, and it includes a full-size billiard table and table soccer. This room provides hours of fun and entertainment for all the family, regardless of age. Furthermore this level also houses the fifth bedroom, which is located at the back and includes three single beds. This roomy bedroom leads to a charming back patio with outdoor bar stools and bar table as well as a comfy divan. All the rooms in the house are fully air conditioned while WIFI and cable TV are supplied free of charge. We do supply a set of linen per each bed and a couple of towels per person. It is then up to one's discrepancy to wash them as much often as desired. Each apartment is adorned with a washing machine and it can be used as often as desired. A security deposit of EUR500 is to be paid on arrival. The deposit is NOT applied toward rent; however, it is fully released provided the following provisions are met.